I suppose it makes sense that my last post from Wyoming is about my favorite restaurant/brewpub in Jackson - the Snake River Brewing Company. They serve good food (an improvement throughout the years I've been told) and even better award winning beer. In three weeks I've been on the premises 4 times, just to give context to my appreciation. The first two times were for light meals or happy hour (from 4-6pm). Today I went to watch the USA vs. Canada hockey game, and the time previous was for a group dinner. I've ordered their soft pretzel (happy hour), bowl of chili (award winning), spicy peanut noodles and today I went with a salad and wings (an unlikely combo but so the US goal with 25 seconds left). Even though the pretzel is $1.50 during happy hour, I'd skip it for the wings ($6.75) that are very good. The chili is also tasty, not quite spicy enough for me liking, but you can always change to suit your needs. I really enjoyed the spicy peanut noodles. Even though I've had a lot of noodle or thai style dishes, everyone does it differently and SRB does it well. The spice level is greater than the average dish so just beware. There's plenty of food too, enough for me to take some home. Has anyone ever noticed that Thai places have the most interesting names? No Thai! Thai Me Up are two of my favorites. I am sure others exist. Erica and I went here for our last dinner together in Jackson last Monday. The food and atmosphere were both first rate and recommended for Thai in Jackson. I decided to make the cold night warmer by adding too much chili peppers to my dish. Man did I sweat, but the noodles still tasted great. 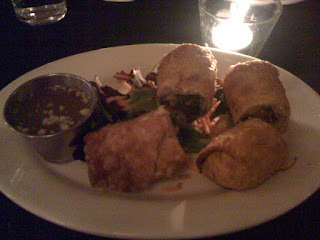 We started with a thai egg roll. 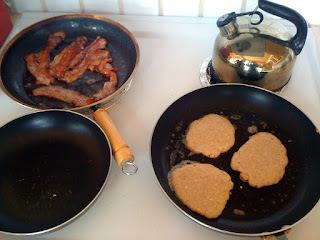 Heavy fried batter, and served pipping hot, there was plenty of goodness to go around. They served it with "peanut sauce," which was more like a sweet dipping sauce with peanuts. I ordered my standard Pad See Ew, which was recommended over the Spicy Noodles. Erica ordered her standard Pad Thai. When it comes to Thai, we are very boring, but we know what we enjoy. My noodle dish was very good and had a generous portion of vegetables mixed in with the noodles. I prefer my Pad See Ew with lots of good sauce. This was a little light on the sauce, but that's just personal preference. I also wanted more spice so our server brought me the hot green chili peppers. I added a little too much. It didn't ruin the dish, it just turned up the temperature significantly. On the restaurant's scale I ordered a 3/5 spice level. Next time I'll go to 4 and see what happens. The service was great, the food pleasing, but the value a little to be desired. Maybe that's just Jackson, but $40 for two entres, one starter and tea should be less than that. In Chicago we go to noodle shops for $7-8. There are some benefits of competition. But since good Thai is hard to find in small towns, you go where you have to. I believe I said in the first post that I would return to Q and try the ribs. I held true to my promise as last week there was a large gathering of 15 people to fine at Q. I'll keep my thoughts to the point. The food is good, especially if you are in the mood for BBQ and "roadhouse" style cuisine. 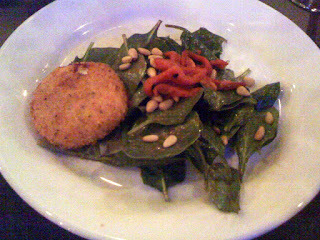 I started with a spinach salad that was very tasty. A little green goes a long way to make me feel better about consuming large quantities of meat. My sister and I shared a full order of the ribs, which ended up being plenty of food (a half portion would have sufficed). When thinking about the ribs I have to say my opinion is mixed. There was plenty of meat on the bones and it was cooked very well. 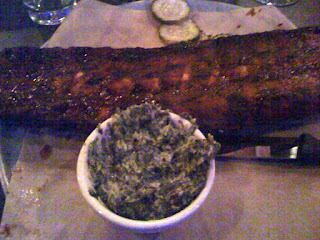 The rub/seasoning on the ribs was also flavorful, but since there was so much meat it didn't last through an entire bite. That brings me to point #2. I love ribs because I love good BBQ sauce and good BBQ can make almost anything delicious. In this situation the BBQ is the weak link, which is very disappointing. They have plenty of sauce bottles on the table, just none that are half as good as Sweet Baby Ray's (or your favorite BBQ). If the sauce were the boss, then the ribs would be king because there is more meat than most people can handle. I've decided if I could bring my own BBQ sauce to the table, I would order one of everything on the menu. On a slightly different note, the creamed spinach side was absolutely fantastic. You have to be a garlic lover to enjoy the side, and make sure the person going home with you does too. Like I've said before, the food is high quality and I might be a BBQ snob. It's worth checking out because if you like their sauce, you'll enjoy your visit. @foodietheapp found this this for me. A quick little list of interesting places coming to Chicago in 2010, many of which are already on people's radar screens a few times over. 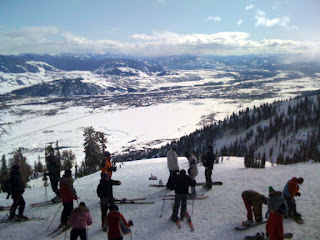 A few quick pictures of what the on-mountain dining scene at Jackson Hole has to offer. If you go to the top of Bridger Gondola you get this view for lunch. You have your choices of eating at the buffet line, or getting a table at Couloir. 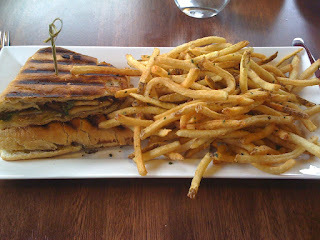 We sat down and I have a very tasty panini with fries. The service was a little overwhelmed that afternoon (they comped half our ticket), but the food was very good. On a different day we ate at the bottom of the mountain at Osteria. As the name implies, it's an Italian bistro. My sister and I shared a salad and pizza, both of which were very good. 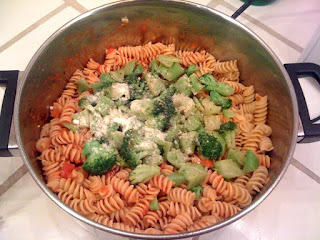 I dabbled at my cousin's pasta dish, which was also very tasty. We ordered the Verdue pizza, filled with veggies. 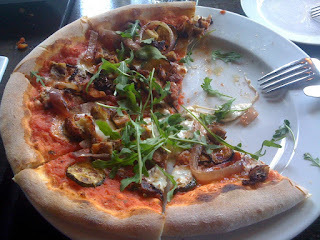 It was very good, but eating half a pizza makes skiing the rest of the day a little tricky. It starts tomorrow, @ChicagoMag has a quick rundown of recommended spots and availability as of yesterday I believe. I'm sure @Gachatz saw this article when it came out, I just happened upon it while reading an old article in the WSJ. It's an interesting piece on "The State of Molecular Cuisine," which gets a lot of play in Chicago because of the work at Alinea and other spots. I find the article right on subject, as I wonder myself how long this kind of style can last and esepcially at the current cost. Give it a read if you've ever eaten somewhere or would want to eat somewhere that specializes in so-called "molecular cuisine." SRG is likely one of the top 3 best restaurants in Jackson, especially in fine dinning category. But fine dining in Wyoming is a little different than Chicago, which is not a qualifier, just an observation/matter of fact. For starters, everything is more family/kid friendly in a ski/vacation/cowboy town than in big cities. Also, the decor is fantastic with elk horns, wooden beams and a large fire burning in the middle of the dining room. These are things you just don't find in the Midwest. Take a look for yourself. Of course, what makes the place great is the food. Be prepared to spend a little coin, but you should know that just walking through the door. The group started with one of the more interesting appetizers you may ever encounter. 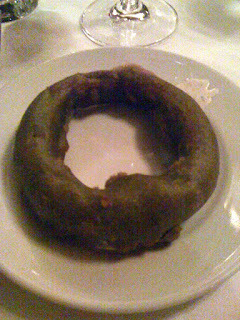 It was an onion ring, but the ring was a green pepper, then everything fried. This gave the appearance of a green onion, when in fact it was a green pepper. Sounds crazy I'm sure, but it tastes great and gives an extra dimension to an otherwise boring dish. I don't know if the picture does justice, but you can see the green. 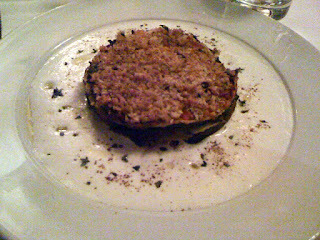 For the main course I went with their version of a vegetarian lasagna. When I say their version I mean that they do lasagna with the cheese surrounding the goods, instead of all together. It is jam packed with fresh roasted veggies, including eggplant, tomatoes, spinach, mushrooms and something else I'm sure. There are thin layers of pasta, but they get kind of lost with the vegetables. That is all topped with a garlic bread crumb topping, then surrounded with a goat cream cheese. The picture will help. 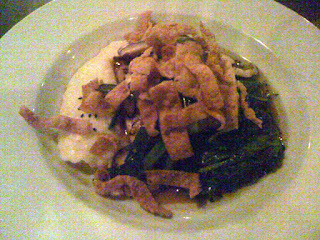 Unfortunately I didn't love the dish, even though I sort of knew what I was getting myself into. I can't quite put my finger on what didn't work well but the experience was only OK. If you ate all of the goat cheese with the goods it probably would have been better, but I was trying to go healthy. The garlic topping didn't seem to add much to the flavor either. Maybe it was the actual vegetables not being seasoned well? Again, since there is a lot going on it's hard to pin point which aspect should be improved, I just know that I didn't want to finish the plate and that's a sign in my book. I feel like a broken record because I'm going to say that I think the place is first rate while at the same time not love my entre. My cousin Andrea ordered a bunch of small plate vegetables such as brussels sprouts and tempura green beans. After she was done I nearly finished off both of them. The brussels were cooked to perfection, served with walnuts and plenty of garlic, olive oil or some other great seasoning. And not to be out done, the tempura green beans also hit the spot, albeit a less healthy one :) They were served with a sweet sriracha dipping sauce that hit the spot. Again, although I did not order the best entre, the food and service at SRG is top notch. There were plenty of things to choose from on the menu and since 9 of the 10 people at table enjoyed their dish, I just goofed. If you're out in Jackson on vacation (or live there) and looking for something different (i.e. upscale), get a reservation to Snake River Grill. I ended up having a valentines dinner after all, my sister flew all the way from California to make it happen. Well, she was already coming to ski with me but it doesn't take away from our fun, impromptu sushi meal. We only ordered two sushi rolls and a dessert, which was all we needed. With the Olympic pairs figure skating on the TV, I'd say the meal was almost perfect...The two rolls were funky hamachi (yes, that's the name) and a special roll with the word geisha in the title. 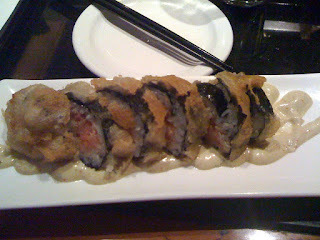 The "funky" rolls featured the entire roll deep fried tempura style and garlic aioli, we simply choose the fish. I didn't love this roll because I felt between the tempura crust and the aioli the flavor of the hamachi was completely lost. The garlic aioli was also too creamy for my liking, especially with sushi (not that I think I've ever had aioli and sushi). The second dish was very good though. 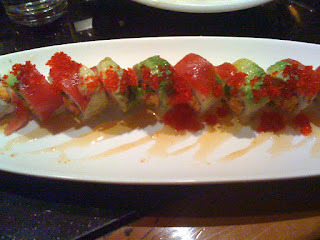 If my memory serves me, the roll was a spicy lobster and tempura asparagus, topped with red tuna, avocado and sweet spicy chili sauce. 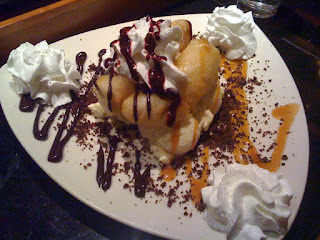 This one I could have ordered again because it was delicious. I'm a huge fan of anything with avocado or tuna and the sweet chili sauce was perfect. The tempura asparagus also added an enjoyable extra dimension. However, the show stealer of the evening was our dessert, something that neither one of us planned on until we saw one go by to the table next to us. Honestly, we were trying to get our server's attention for the bill, and when she came over we ordered a fried banana split instead. I don't need to make an comments or descriptions, the picture pretty much sums it up. So that was our short but sweet (pun intended) meal. While we both had valentines elsewhere in the country this evening, I think we both agree loving siblings isn't a bad alternative. Good Eating salutes those people in the Chicago-area food and beverage world who are making a difference through their passion, vision and commitment to quality. This year's awards go to a range of experts, including entrepreneurs, auctioneers, consultants, cooks and cheese mongers. All have enhanced the Chicago scene with their accomplishments. This will be quick. 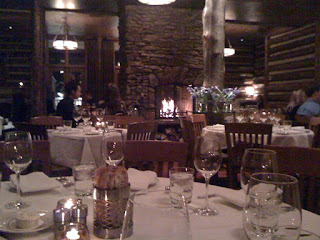 I had dinner at Q Roadhouse a few days back after skiing Jackson Hole all day. I think it is one of 3 or so restaurants in the area between Teton Village and the town of Jackson. I crave protein after a long day on the slopes so I ordered a Tuna fillet, which is buried under some wanton crisps, greens and mashed potatoes. The sauce was a sesame sweet glaze, which was tasty at first, but became overwhelming by the end. Ironically I finished everything on my plate, except the tuna because the sweet sauce became too much (I'm usually a huge sauce fan, especially sesame, but this was too heavy on the sugar). Now the other logically question is why did I order a sesame tuna at Q Roadhouse (think bbq spot with peanut shells all over the floor). The short answer is that I know I will be going back soon and will order the ribs during that visit. 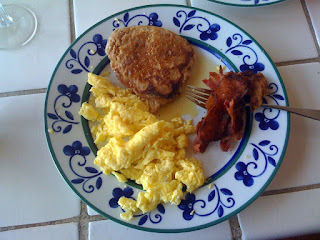 The short version of the long answer is that I didn't want meat and I wanted to try and eat something remotely healthy. Breathing clean mountain air and skiing all day makes me want to be healthy (converse to some that give extra leeway due to the exercise). I can also confess that the french fries were amazing, especially when drenched in the house spicy bbq sauce. Anyway, I'll give a more detailed bbq experience when i go back for the ribs, but the food here is always good and the menu is not overly complicated. It's called a roadhouse for a reason, and if you need a break from the Village or Town, check this place out. You can be a part of Time Out Chicago's Eat Out Awards. Here's how: Pick your favorite chef, restaurant or blogger in the categories below. Ballots must be cast by 9am on March 15. The 20 Readers’ Choice winners will be announced in TOC’s April 15 issue—along with 15 Critics’ Picks. There is good reason why @ChicagoMag named May Street Market one of the best new restaurants of Chicago in 2006. They serve high quality food and have attentive service in a comfortable and welcoming environment. As I mentioned in a previous post, Mondays at MSM are special because they offer a 3 course prix-fixe for $25 AND it’s BYOB. So in addition to the qualities I just mentioned, our meal also featured a very healthy helping of value. The prix-fixe option doesn’t give you a full run of the menu with only two selections per course, so I recommend investigating before committing a reservation if this is your main objective. Since we knew what we were getting before walking in the door, everything went smoothly. You could choose from either a beet salad or butternut squash soup to start, turkey leg or salmon for the entre, and a cupcake flight or S’more for dessert. We ended up ordering everything but the beet salad. We both enjoyed the soup very much. I love soup, and especially during cold winter nights. 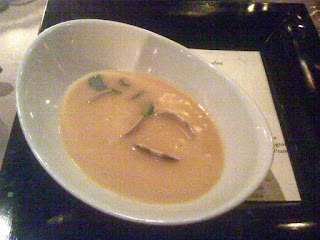 The butternut squash was not cream based, having only coconut cream for texture. There was a hint of spice which also makes a soup even more warming during the season. The one surprise we had, and this may have been simply not reading the menu closely, were clams in the soup. I am not usually a clam person but the flavors and textures worked well. The first course was a 4.5/5. Thanks to @TOCEatOut, @seriouseats and @ZagatBuzz for the buzz on the new season of Top Chef Masters. A couple of links for your pleasure. Nothing new or secret, but let the trash talking begin. Entertainment Weekly also has this on the new season. Nothing like a bowl of pasta with greens after a hard day of skiing. I better not finish it in one sitting. No Internet means short post from phone. Hope to change that tomorrow. I know there are a lot of noodle and sushi places in chicago, but this one surprisingly ranks right up there with the best of them. I say surprising because it is so close to my apartment, and located right under the train that I also walked by and chuckled at the location and small interior. But we finally ventured in for dinner and are very happy we did. I will say I have had their sushi before, and while the quality and taste was very good the price startled me. Their specialty maki rolls can run you $14. There are cheaper sushi joints nearby. However, in this trip I was in a noodle mood so I was very interested to see how it would compare with other favorites like Satay, Joy's, and others. I am very happy to report that the noodles were fantastic, cheap and plentiful (added bonus to find a good spot so close). Since leaving Ann Arbor I have been looking for some place to meet the high standard set by No Thai! in making a great Pad see ew, my favorite noodle dish. The Pad see ew was as good as I've had in a long time. Lots of food, broccoli, spinach and a healthy dose of spices (I asked for it). The sauce is what makes it all work, and this is where most places let me down. Not here though. If you don't want to host a party, @TimeOutChicago has a great roundup of bars and restaurants with great deals. "All-you-can-eats, gourmet game days and deals for football-loving foodies"
An article from @NyTimes to get into the Olympic spirit, especially those lucky few who will travel to Vancouver. I'll get the gripping out first, I didn't realize a "homey" and "neighborhood spot" serving "comfort" food would entail an hour and half dinner for two. This too at 8pm at night, I was surprised by how slow our service was considering we ordered two drinks, two pasta dishes and a starter. The place was busy, and the hostess even mentioned that she was surprised, but overall it appeared (and executed) as if they were not prepared for a full house on a Wednesday night. Fortunately, that is probably the only real negative from our experience last night. The design and decor are quite interesting. I've been told that many bars and restaurants have tried this same space but to no avail. You can tell that they did not try to build out anything new, and made the surrounds fit their needs. Which, at the end of the day, I think works very well. There is wood paneling and coat hooks throughout the place, a fireplace and large bar by the front. We even ended up at one of two tables in the back that are located up a few steps. I felt like I was on a perch overlooking the place, and I really enjoyed the vantage point and seclusion. Erica even mentioned that she felt like this could have been on the side of a mountain, highlighting the faux (made of wood) deer head mounted over the fireplace. The servers were even wearing aprons on top plaid button downs. The mood was set and it worked with the concept. Last night I went to @DMKBurgerBar to try the launch of the #5 burger, where it was offered free the first 55 ordered. Since DMK is just down the street, I decided what the heck, free burger from a place I know I enjoy. The No.5 is a burger with Prosciutto, Fontina Cheese, Basil Pesto, Sun-Dried Tomato, and salt-vinegar chips. Now, it's definitely not what I would normally put on a burger, but that's why I'm not a chef. I'm also a pesto lover (if you didn't know) so anything with pesto always gets a look. Which is also not surprising that the pesto was my favorite part of the burger, along with the roasted red pepper. The meat was tasty as always so right there I think you have a good idea. But it didn't stop there, you also have prosciutto and salt/vinegar chips to work with. I'm not a fan, nor an enemy of prosciutto, but when it comes to adding meat to an already meaty dish, I just assume keep it to one animal. I enjoyed the first couple of bites, but after that I had had enough. Also, I'm not a huge salt and vinegar chip person, so after a few bites I brushed those to the side. All in all, DMK makes great burgers and serves any drink you want. Since the menu has 12 different burgers to choose from, there is something for everyone, I just wouldn't run back to take on the #5. Another great resource from @TOCEatOut, they have a run-down of the menus from all participating restuarants. Make your reservations soon though. I temporarily forgot about this article in @ChicagoMag a few months ago. We made reservations to check out the prix fixe menu next Monday at May Street Market. We'll get 3 courses for $25 AND it's BYOB. Sounds close to stealing. Anyway, other places on this list are definitely going to be considered in the near future. Does anyone have a favorite recipie for making pesto? My mother is my personal favorite for pesto making and nothing I have tasted and will taste could ever compare with years of childhood memories of my favorite green stuff. But since I bought Erica one of those mini food processors, we couldn't help but try and make some since I can't stand to purchase store made pesto. We made our second batch tonight, and for some reason still haven't found that magic combination of basil, garlic, cheese, nuts and olive oil. Tonight we were a bit light on the oil, a bit heavy on the salt but still turned out ok. If anyone has a tried and true pesto recipe, I'd love to check it out.